Master tape of Bruce Springteen’s fabled 1978 Agora show: Whatever happened to …? Henry LoConti, owner of the Agora music hall, produced a three-disc set of Bruce Springsteen’s 1974 and 1978 performances at the Agora. “Whatever happened to . . .?” is a weekly series updating some of the most newsworthy and interesting local stories covered in The Plain Dealer. Whatever happened to the legendary “master tape” of Bruce Springsteen’s famed 1978 show at the Agora? If he can get an approving nod from Springsteen’s management, visionary Agora owner Henry LoConti hopes the recording can be heard by fans, and yield a Boss-scale benefit for the city that first embraced him 40 years ago. For now, however, the reel-to-reel tape, handled only by gloved hands, rests in a vault at the Western Reserve Historical Society, where LoConti donated it. Visitors can hear other Springsteen material on listening stations at the society, spokeswoman Angie Lowrie said, but that tape is not in a format to be included. The tape, more than three hours long, was for a live album that never was. The show was the WMMS 10th anniversary concert of Aug. 9, 1978, for which more than 1,200 fans, who were awarded free tickets in a postcard giveaway, packed the Agora’s original site on East 24th Street. Springsteen and the E Street Band, who had been touring since May, stayed in town for several days for it. WMMS simulcast the concert live in stereo to a network of FM stations — more than 30 of them, in LoConti’s recollection, including Chicago and Detroit — which made it one of Springsteen’s most widely bootlegged shows. Former WMMS programmer John Gorman recalls in his book “The Buzzard” that Bob Seger told him he recorded it off the radio in Detroit, calling it “the greatest rock ‘n’ roll show I ever heard,” and drummer Max Weinberg called it the best show the E Street Band ever did. One audio feed from the show went to a production truck outside the Agora for radio. LoConti would like to release the boxed set to support the Western Reserve Historical Society, but so far Springsteen’s manager won’t approve the release. Another line, LoConti said, went directly upstairs to Agency Recording Studios, and was captured on 24-track tape for a possible album. That’s the pristine master recording in the vault. 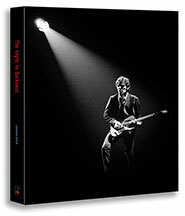 LoConti recently made the recording into a very limited edition four-disc box set (so limited there were only 10 copies) that also included the 16-track recording of an hour long Springsteen show at the Agora from June 1974, when the E Street Band included keyboardist David Sancious. He sent copies to Springsteen, Miami Steve Van Zandt and Springsteen’s management, asking permission to issue the set for sale, with all proceeds going to the Western Reserve Historical Society. But LoConti hasn’t given up the idea. He would, in fact, like to take it up a notch with a higher-cost version of the box set that would add a DVD from an Aug. 30, 1978 show at the Agora with Southside Johnny and the Asbury Jukes. For its last 28 minutes, they’re joined onstage by Springsteen, Miami Steve and Clarence Clemons, who came from playing a show at the Richfield Coliseum. Five cameras recorded video because the show was being shot for the “Live at the Agora” TV series. Miami Steve would not allow the 28-minute closing jam to be used in the show, however, because he did not want the high-profile guests to take attention away from Southside Johnny. LoConti hopes he now can get permission to use the video. In his vision, the money from the box sets would be used to give the historical society’s Crawford Auto-Aviation Museum its own separate home in Midtown on the Euclid Corridor.